The TMT primary mirror is segmented comprising a total of 492 hexagonal segments, each about 1.44 meters (56.6 inches) across corners. The segments fit very closely together, and are spaced with gaps of only 2.5 mm (0.1 inch). Artist rendering of TMT Observatory on the Observatorio del Roque de Los Muchachos (ORM) in La Palma. The image shows the operations facility adjacent to the telescope. A viewing gallery will be built next to the main entrance, within the facility building, available to all ORM visitors who want to see the giant telescope from up-close. 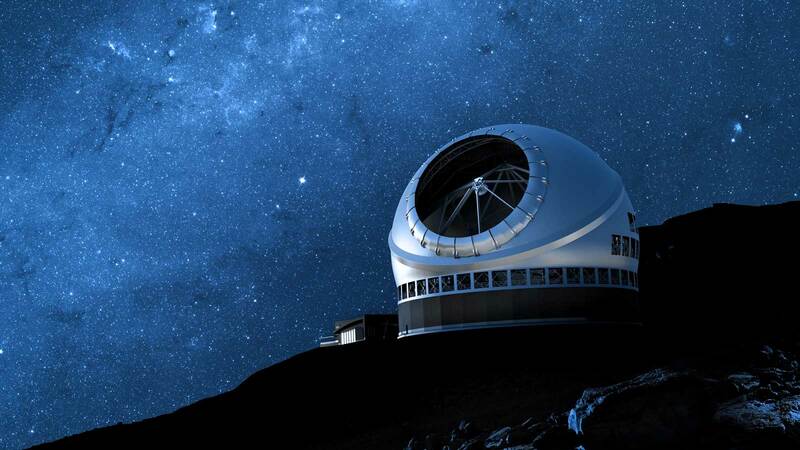 ORM is the alternate site for the Thirty-Meter-Telescope; Maunakea, in Hawaii, still being currently the official site where TMT will be built. A 3D rendering of the Thirty Meter Telescope showing the telescope pointing vertically inside its enclosure. The full telescope structure is visible, with a 30 meter diameter segmented primary (M1), an active secondary (M2) and an articulated tertiary mirror (M3). Science instruments are mounted on the two large diagonally opposed Nasmyth platforms surrounding the telescope. Another platform supporting the M1 segment handling system is also shown, as well as the vertical servicing platform to access M2 and M3. This rendering shows excellently how the structure of the telescope has been compactly designed to fit within its minimal size enclosure.